Defending champions, the combination of Germany’s Patrick Franziska and Denmark’s Jonathan Groth, made their intentions perfectly clear on the morning of Friday 24th August at the Seamaster 2018 ITTF World Tour Czech Open in Olomouc. They are the owners of the title and it is theirs for keeps. The top seeds, they booked their place in the final courtesy of success in opposition to the partnership comprising Denmark’s Anders Lind and Hungary’s Bence Majoros (11-7, 11-9, 11-8), a pair who had been required to compete in the two day qualification tournament and most certainly were in a rich vein of form. At the quarter-final stage they had caused an upset but perhaps they had inside information; they beat Nandor Ecseki and Adam Szudi, the no.3 seeds and like Bence Majoros from Hungary (11-4, 11-8, 2-11, 11-8). Success against Anders Lind and Bence Majoros but it was the quarter-final win that underlined the intentions of Patrick Franziska and Jonathan Groth; they overcame a partnership which one thought may upset their aspirations. They accounted for Japan’s Tomokazu Harimoto and Yuto Kizukuri, the no.5 seeds, the pair who last year on the Seamaster 2017 ITTF World Tour in China, had sensationally recorded a semi-final success against Fan Zhendong and Xu Xin, the reigning World champions. In Olomouc, Patrick Franziska and Jonathan Groth demonstrated that they were as good as any pair on planet earth; they beat Tomokazu Harimoto and Yuto Kizukuri in four games (8-11, 11-8, 13-11, 11-9). In fact, if they beat the pair who beat the World champion, are they not logically, the best pair on planet earth? Impressive from Patrick Franziska and Jonathan Groth, it was the same in the opposite half of the draw from Sweden’s Mattias Falck and Kristian Karlsson, the no.4 seeds. They ended the hopes of Korea Republic’s Cho Eonrae and Kim Minhyeok (11-8, 11-4, 11-9), a pair who had been required to compete in the qualification stage but with Cho Eonrae on duty, now 32 years old and with a wealth of experience, it was a formidable pair. Furthermore neither was a stranger to a final in the Czech Republic. In 2016 both Koreans had appeared in the Men’s Doubles gold medal contest; on that occasion Cho Eonrae partnered Park Jeongwoo, they beat Kim Minhyeok and Park Ganghyeon to seal the title. A straight games quarter-final success for the Swedes, in the penultimate round it was just the same; most impressively they beat Germany’s Ruwen Filus and Ricardo Walther, the no.2 seeds (11-7, 11-8, 12-10). 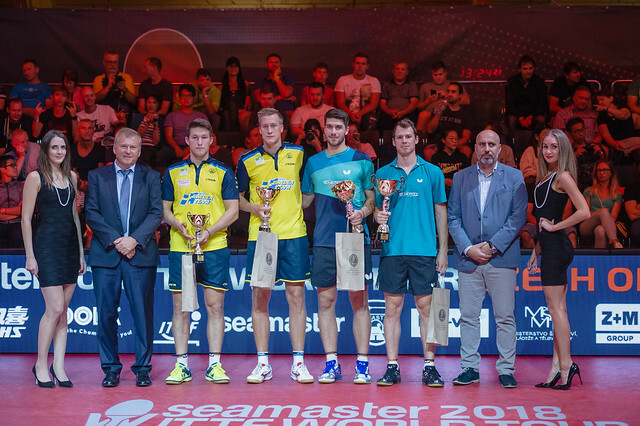 Thus for the second time, Mattias Falck and Kristian Karlsson booked their place in an Olomouc final; in 2012, the tournament’s first edition, they had finished in runners up spot, beaten by the Korea Republic’s Lee Sangsu and Seo Hyundeok. Now on the afternoon of Sunday 26th August, for the Swedes will it be déjà vu or one step higher? Patrick Franziska and Jonathan Groth hold the answers.